Ring News 24Boxing News Breaking Boxing NewsWhat’s Happening with “Tank”? I’m really excited by this little guy and he’s one of my favourites but it’s gone a bit quiet on him recently in the boxing world. Gervonta Davis is a southpaw fighter who was born on 7th November 1994 and comes from Baltimore, Maryland. He has a perfect record of 20 fights, 20 wins, 19 wins by way of knock out and 1 by decision. With a nickname of “Tank” it’s understandable, he’s bull dozed 19 of his opponents. Gervonta comes from the Sandtown, Winchester community in West Baltimore which is known to be one of the most crime ridden areas of the city. He attended Digital Harbour High School but dropped out to fully focus on his boxing career however, he later earned his secondary degree through a GED program. During his early life and his amateur days Gervonta trained at Upton Boxing Center under Calvin Ford from the age of five. He had a very successful amateur career winning many national championships including the 2012 National Golden Gloves Championship, three straight National Silver Gloves Championships from 2006 to 2008. Two National Junior Olympics Gold Medals, two National Police Athletic League Championships and two Ringside World Championships among others. Gervonta finished his amateur career with a fantastic record of 206-15. 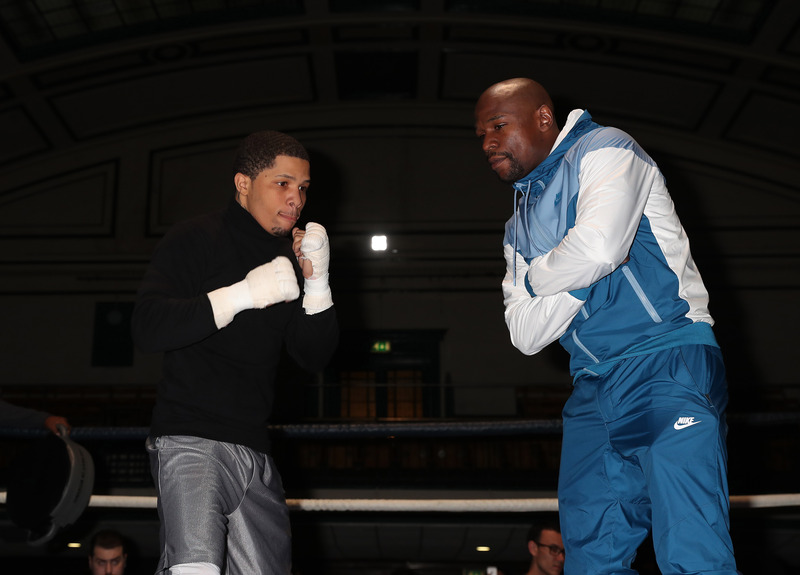 On 22nd February 2013 at the age of 18 years old Gervonta Davis made is professional debut against Desi Williams who had a professional record of no wins and 4 losses. The fight took place on the undercard of IBF Super Lightweight fight between Lamont Peterson and Kendall Holt at the D.C Armory in Washington. Gervonta won by a 1st round knockout and by August 2014 he had 8 wins, no losses with all the wins coming inside the distance. This was the beginning of a string of victories for the “Baltimore” boy…….. In October 2014 for the first time Gervonta was taken the six-round distance against 28 year old German Meraz who’s record stood at 47-31-1,25 KO’s. Gervona knocked Meraz down in rounds 3 and 5 and went on to win a unanimous decision, winning all rounds on the three scorecards (60–52, 60–52, 60–52). On 20th February 2015 at the CONSOL Energy Centre in Pittsburgh, Pennsylvania. Tank became the first person to stop Puerto Rico’s Israel Suarez (4–4–2, 1 KO), winning in devastating fashion with a first round knockout. On 22nd May 2015 at The Claridge Hotel in Atlantic City, New Jersey he scored a technical knockout against Alberto Mora (5–3, 1 KO) of Mexico 1 minute, 14 seconds into the fight. The normally durable Mora was stopped for the first time in his career. On 12th September 2015 at the MGM Grand Garden Arena live on Showtime saw Tank on the undercard of Floyd Mayweather v Andre Berto. It took Gervonta just 94 seconds to beat Recky Dulay (8–1, 5 KOs) of the Philippines. On 30th October 2015 in Orlando on Bounce TV, Davis beat former featherweight world titleholder Cristobal Cruz (40–18–4, 24 KOs) of Mexico. On 18th December 2015 at the Palms Casino in Vegas on Spike TV, another win by ninth-round knockout of Mexico’s Luis Sanchez (17–4–1, 5 KOs). On 1st April 2016 on Spike TV, Davis defeated Guillermo Avila (16–5, 13 KOs) by a knockout in the sixth round. On 3rd June 2016 at the Seminole Hard Rock Hotel and Casino in Florida as part of a Premier Boxing Champions card, Davis knocked out Marco Antonio Macias (28–18, 14 KOs) of Mexico with his first punch of the fight, which lasted only 41 seconds!! On 15th November 2016 ESPN announced that Gervonta Davis would challenge for the IBF Junior Lightweight Title against undefeated fighter Jose Pedraza who had a record of 22-0, 12 KO’s on 14th January 2017 at the Barclays Center in Brooklyn on Showtime on the undercard of James Degale and Badou Jack. The IBF granted Pedraza an exception to fight Davis, as he had a mandatory fight against British boxer Liam Walsh looming prior to the fight being announced, Mayweather Promotions matchmaker tried to make a deal for Davis to fight titleholder Jason Sosa. Gervonta beat Pedraza with a 7th round knockout to win the IBF Junior Lightweight Title. After the fight Davis said that he had studied the early career of his promoter and mentor Floyd Mayweather Jnr in order to stay composed. He said “I had a lot of experience from the amateur ranks but I learned how to keep my composure. Floyd told me to stay calm and I studied the Floyd Mayweather back in the Pretty Boys days. My uppercut was my best shot and it was landing all night. It felt really good to fight the way I did. I proved that I could take it and dish it out”. Floyd enthusiastically branded his protégé as the future of boxing. The scorecards showed that Davis was ahead on points 59-55 on all 3 judges’ scorecards not that those were needed. Gervonta’s first title defence was to take place against Liam Walsh (21-0, 14 KO) who was also ranked number 1 by the IBF. The fight was scheduled to take place on 20th May 2017 at the Cooper box Arena, London and billed as “Show Me The Money”. At the weigh in Davis made weight on the third attempt. On his first attempt he weighed 2 ounces over even though he was naked. He was given 2 hours to attempt to lose the extra weight, he came back earlier thinking he had lost it. He eventually met the limit of 130 pounds on his third attempt. Davis stopped Walsh in the third round to retain his IBF title. The fight was shown live on Showtime in the US. In July 2017 there were rumours that Gervonta would feature in the co-main event of Floyd Mayweather Jnr v Conor McGregor on 26th August 2017 at the T Mobile Arena in Vegas. On 29th July 2017 The Ring Magazine reported that Davis would probably defend his IBF title against former WBO champion Roman Martinez who lost his last fight by knock out to Vasyl Lomachenko in June 2016. On 10th August 2017, Ringtv reported that Davis would fight unbeaten prospect Francisco Fonseca (19-0-1, 13 KOs), who at the time was ranked number 7 by the IBF. According to various sources, the potential fight with Martínez was dropped because of short notice and Martínez would not have had enough time to make the 130 pound limit. Prior to the fight being announced, the IBF had ordered Fonseca to fight their number 3 ranked fighter Billy Dib (42-4, 24 KOs) in a final eliminator, as they were the two highest ranked available. At the weigh in, Fonseca hit the 130-pound limit however, Davis showed up an hour late and came in at 132 pounds, 2 pounds over the weight limit. Davis declined to weigh in after two hours which forced the IBF to strip him of his title. The title was declared as vacant but was still up for grabs, if Fonseca secured the win. Davis won the fight by knockout in round 8 with the ending being a bit controversial. On the 15th November 2017 Leonard Ellerbie, CEO of Mayweather Promotions announced that Gervonta would make his return to the ring in the first quarter of 2018 along with stablemate Badou “The Ripper” Jack. Ellerbie also confirmed Davis would fight a high-level opponent and according to Ellerbie, Davis would remain at super featherweight and likely challenge for a world title in 2018. On the 24th January 2018 Showtime announced that Davis would appear on television on the undercard of Broner v Vargas on the 21st April 2018 at the Barclays Centrer in Brooklyn, New York. A deal was close to be reached for Davis to fight former Australian world champion and ranked number 3 with the IBF Billy Dib (43-4, 24 KO’s, 2 NC) in what would be an IBF eliminator. The purse bid that was due to take place on the 25th January 2018 was postponed to the 6th February 2018 and on 21st February 2018 it was reported by ESPN the fight wouldn’t take place and Davis’s likely opponent would be former featherweight champ Jesus Cuellar. The fight was finalised on 5th March 2018 for the vacant WBA Super Featherweight Title. Gervonta Davis became a two-time world champion by knocking out Cuellar in round 3. Davis first knocked down Cuellar i round 2 with a left hook to the body and then put him down twice in round 3 to finallyget the stoppage. Davis landed 49% of his power shots in the fight. I think for me Gervonta’s performance against Jose Pedraza was outstanding, he threw right hooks to the body, punch combinations and the famous corkscrew uppercuts. He had speed, power and accuracy that night and it was like watching Iron Mike, Ricky Hatton and Naseem Hamed all rolled into one. I loved it. I just hope that he can settle down now in his career, get focused and start putting on those performances again.